Syncing data in our product GUMU™ SAGE ERP X3 Integration for Salesforce is a powerful feature and it empowers you with the ability to import any data in Salesforce from Sage ERP X3. The feature provides completely dynamic mapping where you can refresh fields and map ERP field with Salesforce field and can fetch and store data in Salesforce. Not just this, we can set relationship between two objects, we can set filters for a particular object, chain to another syncing process. This data can further be leveraged to perform analysis using any Wave analytics, Dashboard reporting and visual charts. Please follow the below steps how to create Entity mapping in integration. – > Login to Salesforce. – > Go to App menu and select “GUMU™ Settings” App from the list. – > Entity mapping list page will display the Entity Synchronizations as shown in above screen. – > You will see “New Entity Mapping” button. Click on “New Entity Mapping” button to create a new mapping. – > Enter the details in Entity mapping Detail section. The entity mappings are identified by their names and hence the name should be unique for each Entity mapping. – > Enter Salesforce object name as the Target entity. – > Click on Entity look-up to select appropriate Sage ERP X3 entity (e.g. CustomerHeader). – > Chain-To is an optional field. You can chain the import of data using this feature. If the syncing is chained, it would trigger the syncing of the next entity in chain once the current import has been executed. – > You can even schedule Entity import to run on a regular basis by configuring the Schedule section. – >Click on “Refresh Fields” and this will bring the list of all the fields in the target entity in the Mapping tab. – >Map the appropriate ERP fields from Source Field list against Salesforce fields. – > Click on “Add Filter Row” button to add filter row. Select source field from the list for which you want to set filter and add the value for the field. – > Select the Active checkbox for all the filter criteria that you want before saving the Entity Sync. – > You can either deactivate the filter by unchecking the active check box or remove the filter by selecting the record and hitting the “Remove Filter Row” button. – > You can set relationship for the Sync if the target object has a parent in Salesforce (e.g. Account-Contact). – > To add a relationship, click on “Add Row” button. – > Select target field from the list. – > Select source field from the list. – > Select Parent Object Name from the list of Salesforce Objects (i.e. Account is parent object of Contact object in Salesforce). – > You can remove relationship by selecting the relation record and clicking on “Remove Row” button. – > After setting all the information, click on “Save button”. This will create your Entity Mapping. GUMU™ connector not just seamlessly integrates the two revolutionary systems Salesforce and Sage X3 but offers a wide range of features and functionalities that benefit your business investments. Greytrix as a Salesforce Product development partner offers a wide variety of integration products and services to the end users as well as to the Partners across the globe. We offers Consultation, Configuration, Training and support services in out-of-the-box functionality as well as customizations to incorporate custom business rules and functionalities that requires apex code incorporation into the Salesforce platform. Greytrix has some unique solutions for Cloud CRM such as Salesforce integration with Sage Enterprise Management (Sage X3), Sage Intacct, Sage 100 and Sage 300 (Sage Accpac). We also offer best-in-class Cloud CRM Salesforce customization and development services along with services such as Salesforce Data Migration, Integrated App development, Custom App development and Technical Support to business partners and end users. 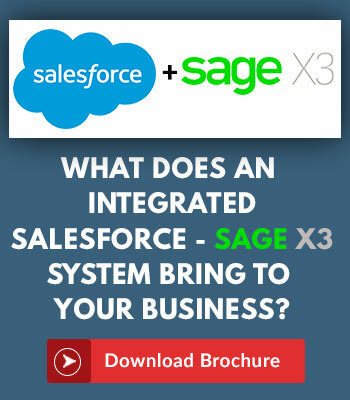 Greytrix GUMU™ integration for Sage ERP – Salesforce is a 5-star app listed on Salesforce AppExchange. For more information, please contact us at [email protected]. We will be glad to assist you. Thinking of enhancing your business processes? Get the best ERP – CRM connector on Salesforce AppExchange!